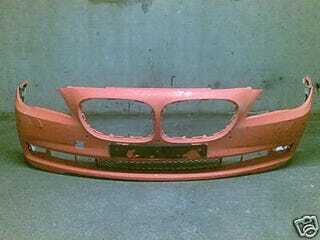 2009 BMW 7-Series Bumper Hits EBay? According to our friends over at Pistonheads, the best place to get a gander at what the new 2009 BMW 7-Series looks like isn't by setting up a tripod on the Nurburgring or by chatting up the forum fan-boys. Nope, it's heading over to EBay where apparently the front bumper for the next generation F01 BMW 7-Series has popped up on the auction site and is now going for a not-so-hefty 5 Euros. We've no idea if the seller is yanking our chain, but if they are, the joke's pretty damn funny. Now only if someone could tell us where to find our Flowbee package. One more pic from the reverse after the jump.